We live in an increasingly image-heavy world. Instagram and Snapchat run our (social) lives, and there's not a meal that goes by that hasn't been documented through your phone's camera. Many people claim to love photography, but taking more photos doesn't equate to taking better photos. Here's where a bona fide photography class comes into play. Nikon School run a variety of classes, catering to either absolute beginners to professionals, and catering to a range of different budgets. I recently took part in the Nikon School's Cityscapes Masterclass at Sydney Tower specialist class, which was held at the Sydney Tower Eye on a bright Saturday morning. 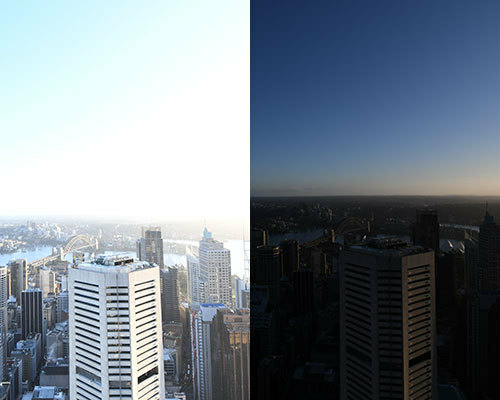 What is the Cityscapes Masterclass at Sydney Tower? This is the ideal class for anyone who wants to get to know their digital SLR a little better. From one of the best locations in Sydney, you'll learn how to take breathtaking sunrise landscape shots and be guided through not just the technical side of shooting with a digital SLR, but also be given tips and handy hints to untapping your creativity when it comes to composing that perfect shot. A two-hour, hands-on course, the Cityscapes Masterclass at Sydney Tower is a new course from Nikon School, and costs $299 per person. 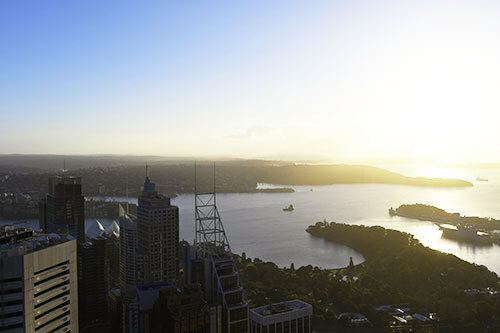 There are many photography masterclasses on offer, but this one allows you to access the Sydney Tower Eye and view Sydney in a unique way. The course runs from 7am to 9am, where you'll get a 1 hour Nikon School Private Skywalk tour as well as an hour's access to the Sydney Tower Eye Observation Deck. A light breakfast of pastries, fruit and beverages are also supplied. The course is run by professional photographer Richard Bulley, who has photographed events, landscapes, portraits, products and much more. He is highly knowledgeable, friendly and, most importantly, incredibly patient. My time at the Cityscapes Masterclass started with extreme excitement (or as much excitement as I could muster up at 6:30am in the morning). I'd been up the Sydney Tower before, sure, but never the outside of it, and never at sunrise. Because of the cold weather, I dressed accordingly - fleecy pants and a warm jumper. I packed a beanie just in case. Public transport from my area of Sydney at that time of the day is scarce, so for those thinking of driving, I found the parking at the MLC Centre convenient to the Sydney Tower's Castlereagh Street entrance. Sydney Tower were also able to validate my parking ticket at the conclusion of the class. For the class, I used the new Nikon D500 DSLR. It's the first Nikon DSLR with the new low-energy Bluetooth sharing service, SnapBridge. This lets you sync your camera to your phone as soon as you take your shots. Whilst a Nikon DSLR isn't a requirement of the class, you are required to bring a DSLR of some sort, as well as your camera's manual, some memory cards, your lenses and pen and paper. Your camera's cable release and tripod are optional, although you won't be able to take your tripod out on the Skydeck. And for god's sake - CHARGE YOUR CAMERA AND BRING A SPARE BATTERY. On arrival we were taken up the elevator to the appropriate level and this is where my adrenalin kicked in. I joined a small group of people, and we were given a brief safety demonstration and a breath test (can you imagine the pain of being up that high and unbelievably hung over?) before being suited up in blue full-body onesies and harnesses. Richard then talked us through the basic functions of our camera, explaining aperture, shutter speed and I.S.O. 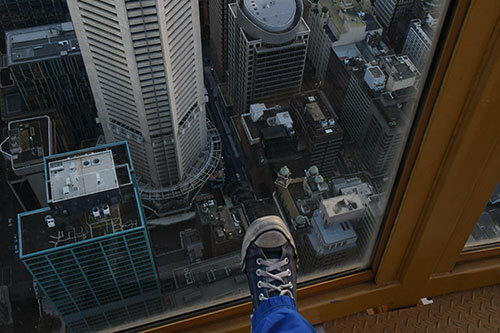 He then explained the best settings for landscape photography and we happily took some shots from the relative warmth and safety of the Sydney Tower's Skydeck. After a while, we were ready to step outdoors. 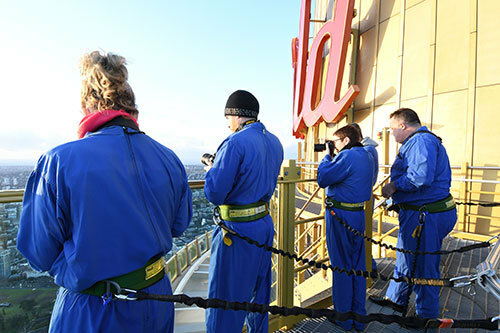 Harnesses in place and now more awake than ever, we were led upstairs and outside onto the Sydney Tower Eye area. If you're even remotely unsure of how you'd fare so high up and exposed, one look at the city in early light will quieten those fears in no time. It's a truly remarkable place to hold a photography class, and you're even more inspired to take amazing shots, all the while having Richard there guide and talk you through how best to compose your shot. Parts of the platforms are glass, so you truly feel like you're out there as much as safety allows you to be. I found my beanie came in handy pretty damn quickly too, as the wind picked up and the cold was more pronounced. 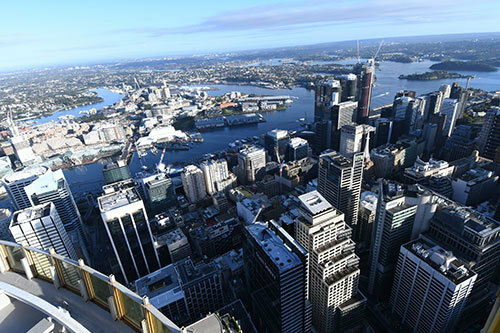 We were able to do the full length of the Sydney Tower Eye, so we were taking shots of all four compass points. What made it even more beautiful was watching how the sun rising affected the light in different areas of the city. One area of the Sydney Tower Eye is a moveable platform - that was a fun surprise. For any photography nerds, shooting from up high onto the rest of the city was incredible. 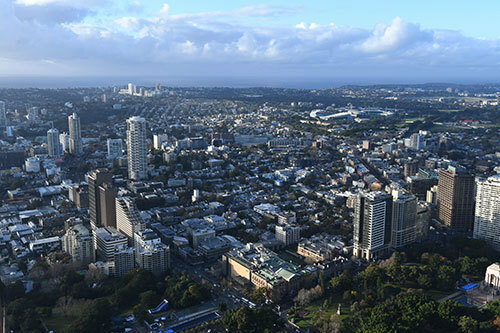 Not only are you able to shoot the cityscape below, but you're also able to look way out to the ocean or the mountains. Richard is also more than happy to give you pointers and suggestions on how best to structure the shot you want. At the end of the 2 hours, when you're back indoors and sipping on a coffee and nibbling on a croissant, you'll have learnt more about sunrise photography, different techniques to capture the best light, composition and other aspects in regards to photography. It was truly not just a well-delivered class, but also an unbelievable Sydney experience. The next Cityscapes Masterclass runs on Saturday 27th August from 7am-9am. This is also run on Saturday, 30th July, but is currently full. Please check back on the website for more details of upcoming availabilities. The cost of the class is $299 per person. Go to school.mynikonlife.com.au/school/courses/cityscapes-masterclass-at-sydney-tower to make your booking.